Update: In a late addition to the GCC schedule, there is now a Q&A seminar with the artists. According to the official schedule the talk will be from 4:00-5:00 at Convention HQ on the 2nd floor. 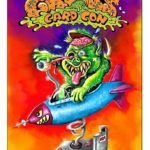 In a little over two weeks, Garbage Pail Collectors from around the country will converge on Las Vegas for Gross Card Con. Gross Card Con is part of the larger Vegas Toy Con being held at the Circus Circus Hotel from Feb. 23-25. This is the second gathering of GPK collectors in Vegas. 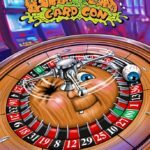 In the summer of 2016, GPK-Con was held in Vegas, and at the time was the largest gathering ever of GPK artists and collectors. GCC is set to break that mark this year with even more guest artists. Scheduled to attend are 14 current and former artists. 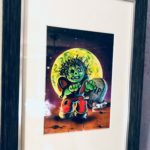 Highlighting the show will be the appearances by Original Series artists Tom Bunk and James Warhola. Both artists played integral parts in the first 15 series of GPKs. This will be Bunk’s second appearance, while a first for Warhola. Almost all the current final card artists will also be in attendance. Returning to Vegas are Brent Engstrom, Joe Simko, David Gross, Layron DeJarnette, Joe McWilliams, and Chad Scheres, while Michael Barnard will be attending his first show. Former Topps artists Jeff Zapata and Mark Pingitore also are returning for their second show. 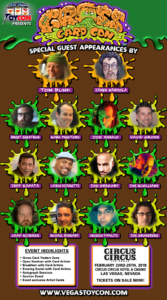 Sketch artists Jon Gregory (2nd) and Vincenzo D’ippolito (1st) will also be in attendance. Finally Wacky Packages artist Joe Grossberg round out the lineup, making his first appearance. What events will collectors have to look forward to while at the show? What type of ticket is best for you? 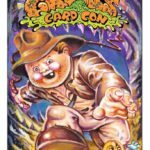 Read on for a quick FAQ of the rundown on this year’s Gross Card Con. What type of ticket do I need? There are three types of tickets being offered for the event. 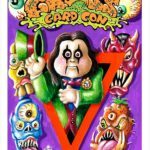 For the most serious GPK collector there is a Super GPK VIP ticket. These tickets are now sold out, so if you missed them you are out of luck! The GPK VIP ticket cost $750, and these few lucky collectors get 4 nights hotel, tickets to the show, early admission, dinners Thurs., Fri., and Sat., a B&W sketch, and the GCC card set, and more! Second, there is a regular VIP ticket. For $150 these ticket holders get admission all 3 days, early admission, and dinners Fri. and Sat. Finally, there is a general admission 3 day or individual day tickets available. The 3 day pass retails for $25, while single day admission is available; Fri. ($10), Sat. ($15), Sun. ($15). A tip for collectors, try checking Groupon for discounts on basic VIP and general admission tickets, you might just get a nice discount! What hours is the show open? The show is open Fri. 4:00 PM – 9:00PM, Sat. 10:00 AM – 6:00 PM, and Sun. 10:00 AM – 4:00 PM. Holders of the GPK VIP or basic VIP tickets will be able to get in one hour early to the show each day. Being a larger toy convention there will be plenty of booths setup selling toys. You will see lots of cosplayers, and even indy professional wresting shows! But you are there for GPK! All GPK artists will be in one area of the show. This allows collectors to have kind of a home base to visit with artists, see people they’ve only spoken with online, and maybe even do some trading! All 14 artists will be in the same area. In addition Clint Coleman and GPK & Wacky Warehouse will have a table set up again selling all things GPK. Is there an artist Q&A session? Unfortunately this time around there will not be a separate artist seminar. Due to space restraints, show promoters were not able to facilitate a Q&A session this year. However, all the artists are very approachable and really do love talking to collectors. Yes there is a late addition to the schedule. The artists will be getting together on Saturday from 4:00-5:00 for a Q&A session. According to the schedule the seminar will be located at Convention HQ on the second floor. I’m a VIP holder, I get dinner(s)? 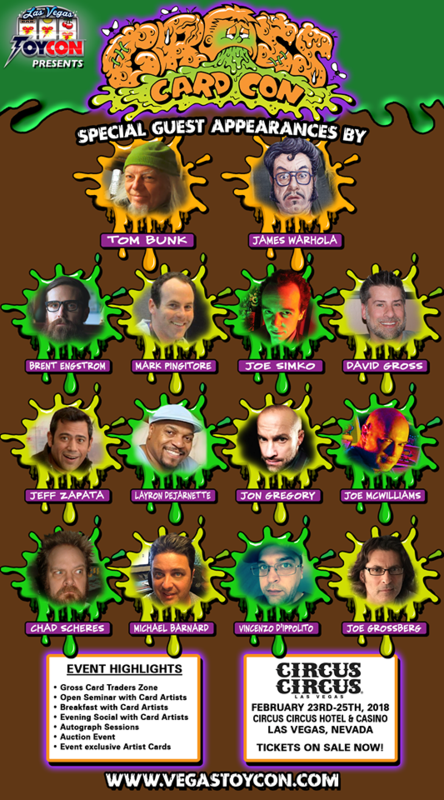 Yes, one of the big perks of the big GPK VIP package is an exclusive dinner with the artists on Thursday night. Ticket holders be sure to check your package details for time and location of the dinner. All GPK VIP and basic VIP holders also receive a ticket to the show wide VIP only dinners on Fri. and Sat. nights at 6:00 PM. General admission ticket holds must separately purchase tickets for the Fri/Sat dinners if they want to attend. 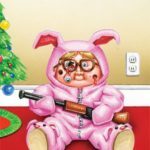 What other GPK events are there? Saturday night there will be an evening social event at the West Bar inside the Circus Circus casino at 11:00 PM. The event is open to all collectors. While there is a breakfast mentioned on the event flyer, that event has been cancelled. Show promoters decided based on feedback from the previous show to leave more time open to collectors to have the freedom to do their own meet ups. Is there a show specific card set available? This year’s set is bigger than last year’s. Collectors will have a few choices this year. All 14 artists have created a card for the event, and in the case of 6 artists a second card. These 20 images will be available for sale in a few different formats. A master show set will be available at the show for $40. Cards #1-12 are regular cards done by the artists attending the show, Bonus #1-2 are the cards created by Tom Bunk and James Warhola. Rounding out the set are card #P1-P6. These are prism cards, printed on a shiny card stock. These images are the second card some of the artists created. Don’t want the whole set? Or just want extras of some? Cards #1-12 will be available by themselves for $15. While cards #P1-P6, will also be available separately for $15. The only way to get the Bonus cards is to purchase the maser set. GPK VIP ticket holders are in luck as the master set is already included in their package. There will also be a limited edition set of those same 20 images available as a proof/blank back set for $40. There are only 100 copies of the limited edition set available for purchase. Artists will also be given a number of their own cards to sell at their table and autograph/doodle on for collectors. Sets will be available at the GPK & Wacky Warehouse booth during the show. Those of you unable to make the show, should contact GPK & Wacky Warehouse after the show to inquire about purchasing any leftovers. Check out some images of the card art that artists have shared already! 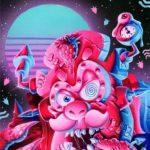 What will the artists have available? Ahhh that’s another article…..coming later this week! Tune into GPKNews to check out some of the goods the artists will be showcasing at the show! This entry was posted in Artists, GCC and tagged Artists, GCC by Jeff. Bookmark the permalink.